Connect remotely to your PC and manage it via Remotic Cloud Hub. Remotix Agent is a free lightweight application, with two purposes. First, it helps to establish a secure connection between Remotix and remote machine, so you don’t have to adjust any NAT, router, or firewall settings. Second, it aids with Remotix Cloud Hub functionality. 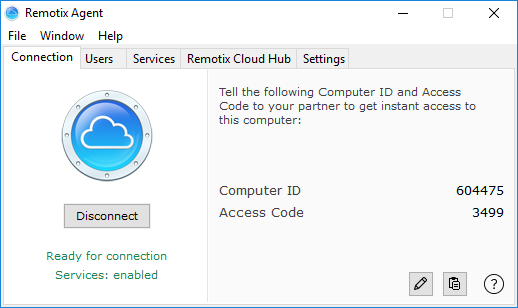 With Remotix Agent installed, you can: - Receive outside remote desktop connections. - Provide an outside access with an access code or by authorizing a Remotix Cloud user. - Keep an eye on security of incoming connections by managing an access code. - Send reports, screenshots and location info to Remotix Cloud Hub. - Allow remote executing of shell commands and performing administrator actions. - Chat with other users connected to your Remotix Cloud.